a short journey – Youpi ! Cher Ami has qualified people in house, a creative director, a copywriter/musician, a front end developer (Etienne Chaumont), a motion designer (Yannice Berthault ) and for this project, they worked with super talented 3D artist Benoît Challand who did all the 3D. I mostly did the WebGL (with THREE.js), took some shortcuts and had to find a couple of interesting solutions that I would like to share here. then if you call a new Car( scene1 ) and new Car( scene2 ), both will appear in their respective scenes when the first has finished loading. of course if a Model is already loaded, it is instantiated directly using the same assets. the textures class is basically static Dictionary that can load textures and materials exposes the raw materials that each object will copy. I used 3 custom materials: a regular “bitmap”, a “blend” and a “transition” material. the bitmap material displays a texture, as we have objects that can have 2 versions of their textures, I added a deltaUv and scaleUv uniforms that let me shift and squash the uvs. for example the following texture is used on the bag in the last bedroom. 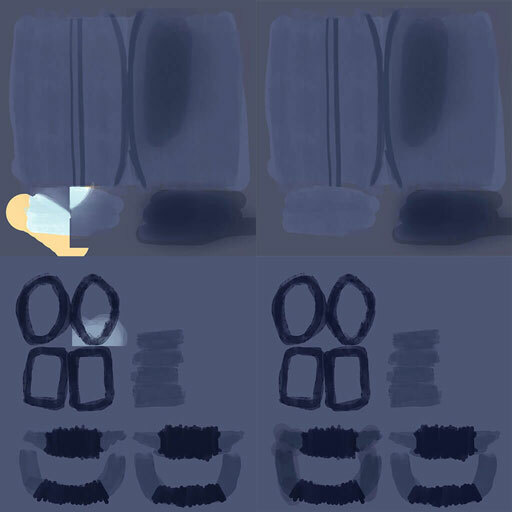 it can be used with scaleUv = .5 a deltaUv.y = 0 to display the top half and deltaUv.y = .5 to display the bottom half, using a deltaUv.x of .5 will switch to the “night”(right side) version of both textures. the material has brightness saturation contrast + alpha uniforms, brightness is used to animate the popups on the desktop for instance. at some point I added a “binoculars” effect hence some extra uniforms and a slightly heavier shader. that’s the vertex shader (nothing fancy…) it’s the same for all 3 materials. the blend material is used to render animated materials, it basically reads a spritesheet and blends 2 “frames” hence its name. at some point we had to choose between morphing two meshes or using this little trick. I did a quick proof of concept which was convincing enough. 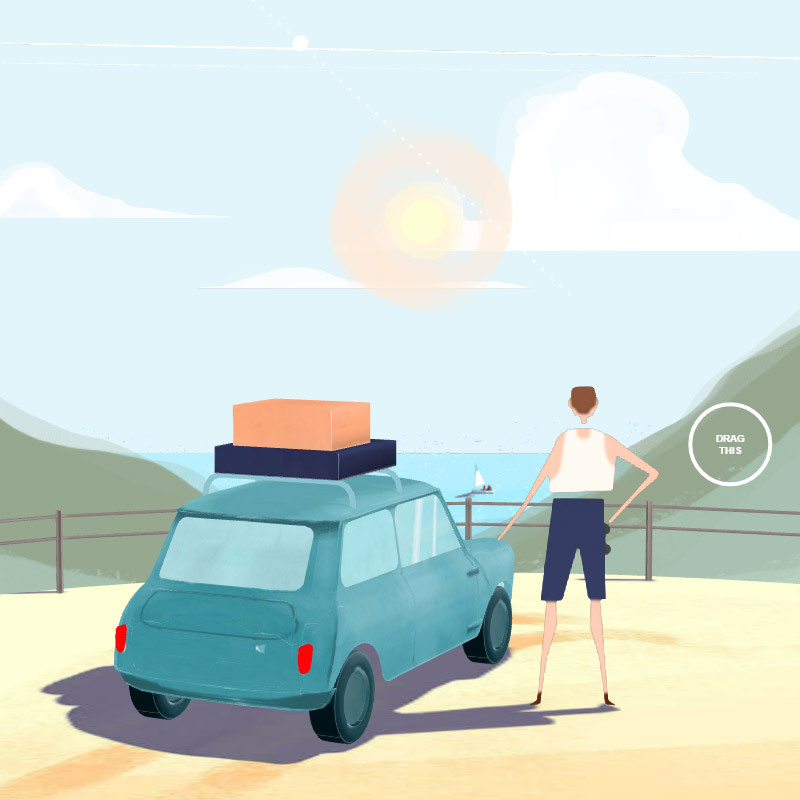 it is used to animate the shadow of the laptop in the first scene, the bag closing in the second scene and on the beach, it is used for the parasol and the bag. //use it to index the "opening"
p0 and p1 are the 2 handles used when you drag the slider on the screen. here’s not exactly the same but the demo I used as a starting point for this shader, click drag around, press play to view the transition itself. now there was a problem: the character. 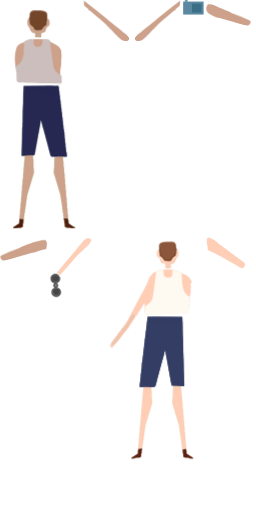 it was the second thing I tackled right after the meshes ; I thought we could use some sort of 2d animation system à la After Effects. then on the JS side, I rebuild the clips and during the update, I recompose the transforms according to a normalized time and a frame count (much like the blend material). apart from the transform matrices, we need the scene dimensions (512*512 in this case) to offset the clips around the center of the 3D object’s center, that’s not mandatory but was more convenient. 1 indeed Flash or whatever animation software usually works with an orthographic projection system, this allows to animate various elements without bothering with their 3D depth ; their position in the display list (or layer) gives them their render order and the occlusion can be computed quite easily. 2 was more problematic, there are several ways to deal with transparency in THREE none of which would work in my particular case : to render the element in the proper order (1 binoculars > 2 shoulder > 3 body ) I had to add a consequent depth between each mesh which made the perspective projection very visible and disconnected the limbs. if I reduced the space between them, I ended up with transparency collisions ; a mesh supposed to be behind another would punch it’s alpha transparency through the one before it, even if I used the renderer’s logarithmicDepthBuffer and / or the sortObjects flag and / or the objects’ renderOrder property, there was no way to properly reproduce the animation. the solution was – of course – to render this 3D objects into a renderTarget with an orthographic camera and use it as a texture for a quad mesh the size of the scene (512*512). no more depth problems and no more alpha transparency problem. there are subtle interactions: in the first scene you can play with the ‘pen pot’ and with the ball or the bag on the beach. this is a simple raycasting test that triggers Tweens with a Bounce easeOut and random rotations… no physics or black magic here, yet it adds a playful touch (I literally spent 30 minutes playing with the pens on the desktop ^^). the rest of the website was taken care of by Etienne and Yannice – imho – the soundtrack and sound FX are pretty awesome and serve the whole experience. to sum it up, I really enjoyed working on this project, it is far from perfect, lots of things could be optimized further but all in all this short journey has a unique look & feel. You are a clever bunny Nicolas! oh wow, graphics is awesome!